Well I never, the quilt show is almost upon me. And I’m all ready! My entries are all quilted, bound and labelled, with the requisite hanging sleeves attached, and I spent an hour at my friend Chris’ this afternoon de-furring them (totally pointless even to consider doing so here…) I’ve just got back from handing them in at my guild meeting tonight, and I’m feeling exhausted! The turnaround all started with a great suggestion from Sarah at Thrift Store Crafter, who said she saw the snail trail block in the embroidery. So I took that idea and went with it! I made twelve 4″ snail trail blocks as an outer border, then I surrounded the embroidery itself with the fabric in the snail trail centres, and added a flying goose block at either end (each with one green and one neutral coloured wing). To echo the black diamond in the embroidery, I added some black bias tape running across the corners of the quilt, and finished it off with a skinny black binding. And it had to be very skinny, given the size constraints of the challenge. I think I came in one mm under the maximum allowable width. Phew! 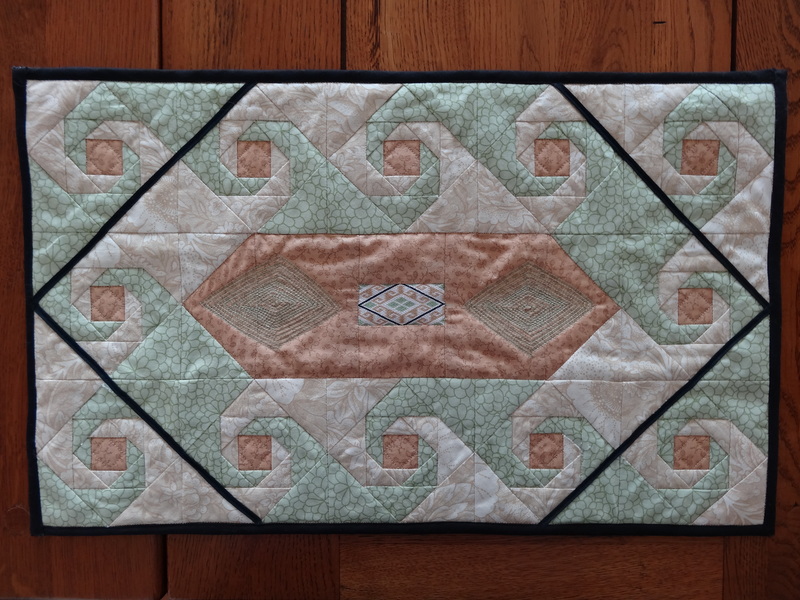 For the quilting, I wanted initially to do something quite elaborate, but my lack of a working foot pedal meant I had to use my walking foot and the stop/start button rather than going free-motion crazy. In the end, it worked out brilliantly. In this case, I feel, less is most definitely more. 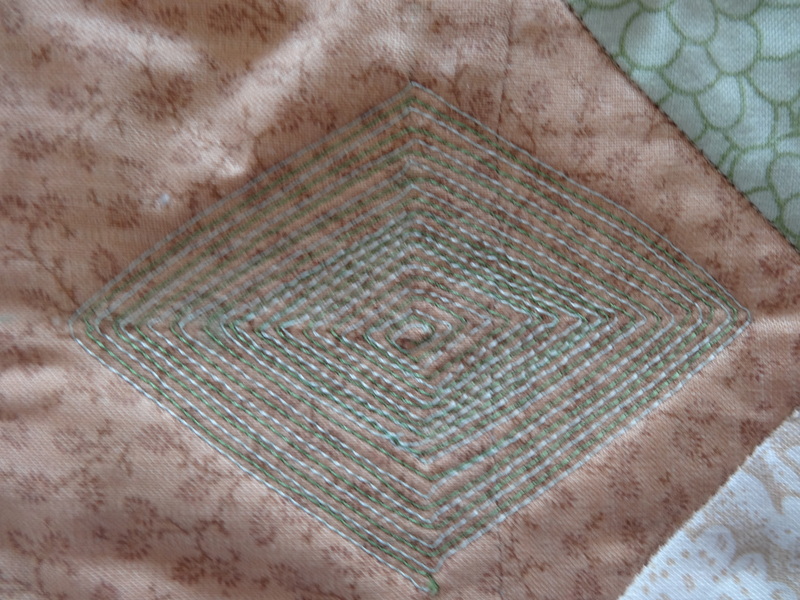 I started out by quilting little on-point squares in the centre of the snail trail blocks, then I ditch quilted around the outside edge of each ‘swirl’. Once the blocks of the border were outlined, I turned my attention to the quilt centre. I wanted to echo the diamond shapes in the embroidery, so I used my walking foot to stitch a radiating diamond pattern on either side of the embroidery piece. 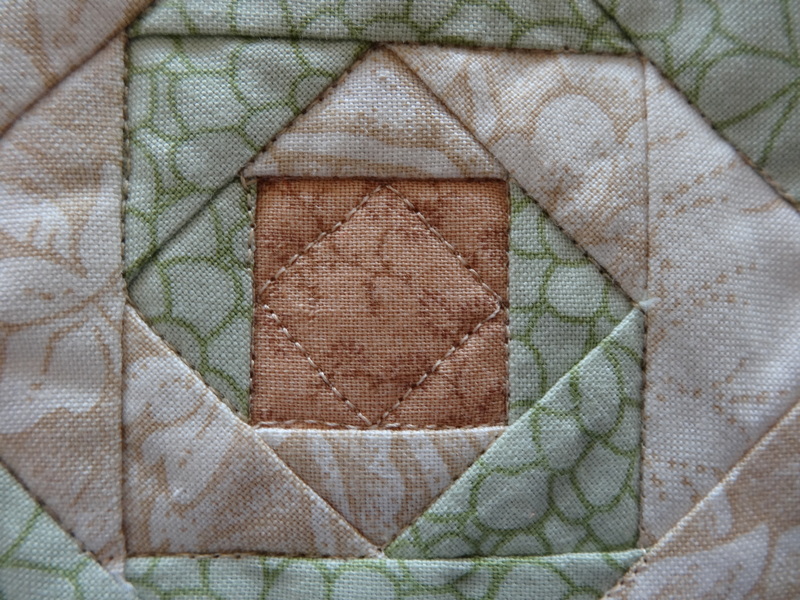 I started with a light green thread, and then I sewed between these stitching lines with a darker green thread. I think it gives the diamonds more of a sense of motion, creates more interest on the quilt, and adds texture to the whole piece. I did consider embellishing the quilt a little, but to tell you the truth, it’s not really me. So I just left it at that. And after all that, I find that I actually like it! We had to give the quilt a name, so I called it “Blackbirds Flock to Guns”. This is an anagram of Some Very Bad Words once uttered by RR during a somewhat frustrating and ultimately unsuccessful DIY session, and it reflects exactly what I felt when I first saw what the challenge involved! I won’t say any more, but you can probably work it out for yourselves if you really want to! It’s Wednesday, so I’m linking on up again to Lee at Freshly Pieced. Why not do the same? Enjoy your retreat – how fun! Wow! That turned out great! Glad I could help in my little way. I love the snail tail blocks! They turned out beautiful. 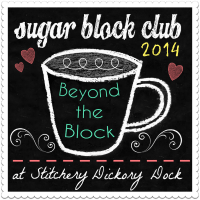 good luck at the quilt show! 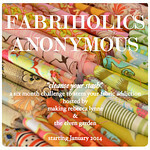 Thanks, Renee, I’m so excited to see my quilts all hung up and (hopefully!) being viewed by lots of people!